Learn how this Oregon school fills learning gaps while building core knowledge. On the first day back from summer break, a significant percentage of our students return to campus below grade-level in reading and math. As administrators and teachers, we know something has to change. While we can’t solve the dilemmas of society at large, we can address the systemic problems in school. At Oak Heights Elementary School in Oregon, we use Response to Intervention (RTI) to address a couple of issues. First, students, who have significant learning holes still need to experience grade-level core instruction. If they are pulled out for remediation during a core instruction, they will fall further behind. Also, it is difficult for teachers to sufficiently differentiate instruction during an intervention block to serve students from the 1st percentile to the 99th percentile. RTI provides a structure for scheduling, staffing, and instruction that addresses those two issues. RTI schedules are driven by the agreement that intervention cannot conflict with core instruction. To accommodate these interventions, we have added intervention and enrichment (I/E) blocks to our daily schedule. Our students receive 35 minutes of math I/E and 35 minutes of reading I/E each day. RTI looks at students’ performance on nationally normed assessments and ranks them in a three-tier system. Tier 1 students are students who respond to core instruction and perform at the 40th percentile or above. These students participate in instruction that enriches and extends their learning during the I/E blocks. Students performing below the 40th percentile are categorized for Tier 2 interventions. They are organized into small groups to receive research-based interventions designed by an intervention specialist. We track their progress with regular assessments during six-week periods and adjust the interventions and groupings based on data. Students who aren’t progressing after several of these six-week periods move to a Tier 3 intervention. These students still receive the Tier 2 interventions, and all core instruction, but they receive additional minutes of intervention in place of elective activities. Interventions and enrichments are also a focus outside of I/E blocks. Filling holes while building core knowledge spans our entire day. To supplement our core curricula and interventions, we are using a software program called MobyMax as a key instructional tool. The program automatically assigns lessons to students based on their skill level, ensuring students practice the skills they need to work on without spending time on what they’ve already mastered. The program’s dashboard allows users to monitor student progress in real time, so they know exactly how each child is doing. Teachers and administrators can see which standards have been mastered—and which have yet to be learned—at the student, class, school, and district levels. 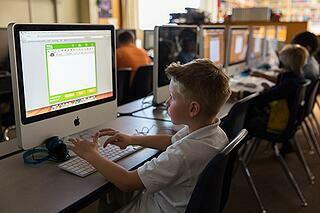 Teachers do regular data-digs within the software, identifying areas that need instruction. Then, during workshop periods, they can target students for further individualized instruction as needed. Courtney Murphy is the principal at Oak Heights Elementary in Sweet Home, Oregon. Her favorite part of being an administrator is helping to grow students and educators. Tim Swanson is a second-grade teacher and writing/edtech coach at Oak Heights. He is also the director of technology for the Oregon Reading Association.